I had such a great response with my last Paparazzi bracelet giveaway, I decided to do it again! 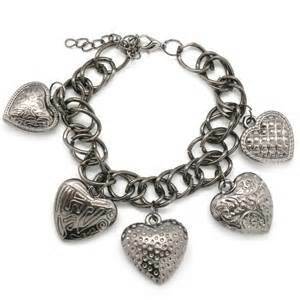 This time I am giving away one of "This Heart of Mine" silver tone bracelet. This is another of my favorite pieces from Paparazzi jewerly, and it's only $5 if you don't want to wait to in it. Just go to http://www.ilove5bling.com. Paparazzi jewelry is a direct sales company where every is only $5. There is trendy, fashionable accessories -- in addition to bracelets there are necklaces, hair bows, hair clips, earrings, and stretch rings. You can also contact me about how you can host a Facebook party and give your friends a chance to purchase $5 jewelry and you can get free items yourself! Giveaway open to the USA to those 18 and older. Winner has 48 hours to respond to winning e-mail or another winner will be chosen. I like the The CHAIN Event bracelet because I like the style of this chunky bracelet. It would go with many outfits especially my black dresses. That bracelet is adorable - what a great gift idea for CHRISTmas!! I also love the Spanish Sun ring! I like the down south barrette. Its real usable and cute! They have so many fun pieces, but I love the Sparkle and Shine bracelet in Pink! This is a great place to get stocking stuffers for my teen and sisters! I like the POSHEST Of Them All bracelet. Risky Business hair clip is fierce! Thank you for the chance to win. I really like the POSHEST Of Them All bracelet. I love the layered look. I love the Glam Rock - Blue Necklace, thanks! I like the Worth A Million earrings. All of them? lol :-) I really like the Roadrunner - Green. I love multi-necklaces. All the illusion of many with only having to put on one! i like the sassy sacagawea headband!